Vologda region specializes in timber cutting as well as producing high added value products. "We invite investors in various sectors, traditionally these are metallurgy and chemical industries. We also have a source of raw materials, mainly comprised of timber. We specialize in timber cutting as well as producing high added value products. The second important area of our interest is agriculture. We are waiting for businessmen who are ready to invest in greenhouse vegetable-growing farming. We have already equipped plots to realize such projects", said Oleg Kuvshinnikov, Governor of the Vologda region. 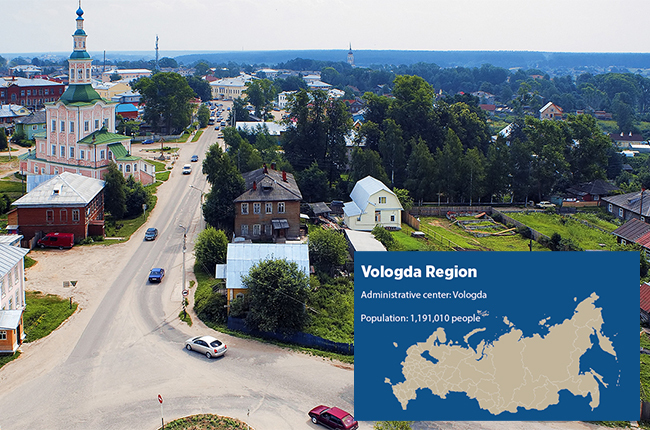 The Vologda region is developing heavy engineering industry and the production of automotive components. The Technopark Sheksna was opened in the region and is ready to accept joint ventures to produce automotive components. Now the Vologda region is negotiating with Chinese investors. "It is a critical juncture for the Russian economy. If in response to the challenges, we have not reformatted our economy within the next 2-3 years, in order to create competitive products, we will be doomed to remain dependent on raw-materials", - said the Governor of the Vologda region. Tourism is among the priority directions for the development. While the industry in the gross regional product (GRP) is just 2%. The task is to raise the volume of goods and services to 5% GRP. "We are ready to open new tourist routes to attract European operators, which this sector needs to attract investment from the EU", - said the Governor Oleg Kuvshinnikov. The largest project with the participation of a foreign investor is a joint venture created by Mitsubishi and PhosAgro to produce mineral fertilizers. Investments amounted to more than 60 billion rubles ($900 mln), for products intended for the domestic market and for export abroad. Nestlé has opened a plant for the production of instant cereals and baby food in the Vologda region. Investments reached 1.7 billion rubles ($26 mln). Their production makes up 25% of the Russian market as a result.